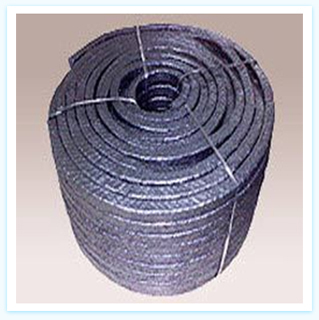 Asbestos Graphite non-metallic packing is formed by interbraided method to from very dense and yet flexible packing. Each thread is impregnated into a solution with high lubrication value, the life of this packing is much then ordinary packing. 6mm – Coil of 5 Kgs. 8mm to 25mm – Coil of 7.5 Kgs. 32mm to 100mm – Coil of 25 Kgs. • General-purpose gland packing for high speed rotating and reciprocating spindles and static.